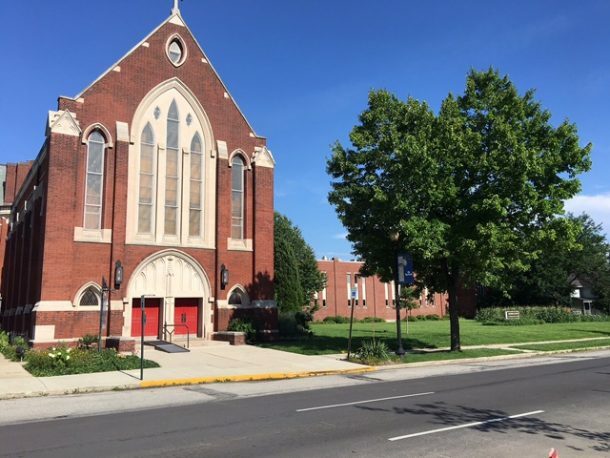 If you have ever driven south of 16th Street on Central Avenue, you may have noticed a big church on the southeast corner. What you may not have noticed is the more recent recessed addition and long lawn south of the historic church. If your family tree stretches back 100+ years, one of your ancestors may have been educated in the building that used to stand there. 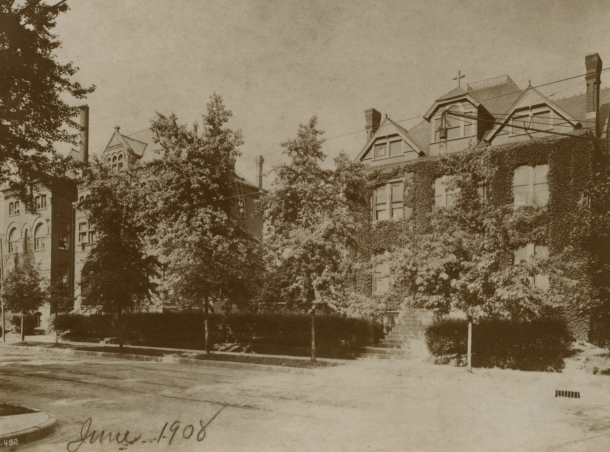 It was September 1891 when the four-story “Saint Mary’s Hall” opened in what is now Old Northside. 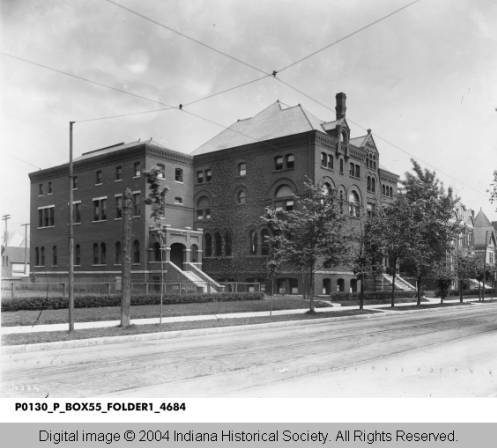 Built for $20,000 on the east side of Central Avenue near Seventh, now 16th Street, it was the second home of the “Indianapolis Institute for Young Ladies,” later “Diocesan School for Girls.” At the time, the Right Reverend D.B. 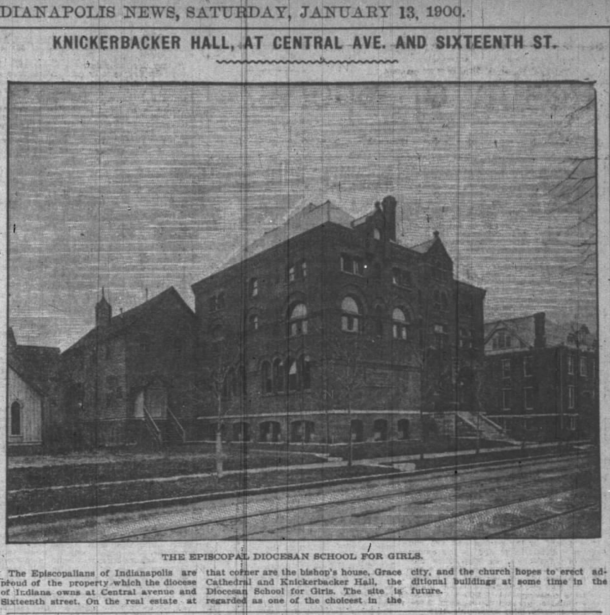 Knickerbacker served as Bishop of the Episcopal Diocese of Indianapolis and though the idea was floated, he would not allow the school to be named for him. At least, not while he was still alive. One of many ads of the early 1890s for art classes offered at the School. There were numerous advertisements in the early 1890’s for the school, and specifically for art classes at St. Mary’s Hall, welcoming members of the public. In 1893, water color classes were instructed by Hoosier Group artist, William Forsyth, just a few years before the John Herron Art Institute (and Forsyth’s tenure there) began its illustrious history four blocks west on 16th Street. Before 1900, the classes and numbers of graduates were nominal–32 students reportedly graduated in its first eight years. The first and primary building included: a large general school room, gym, studio, laboratory, music room, drawing room, parlor, and bedrooms for boarding pupils–25 could live on site. The school was still growing. 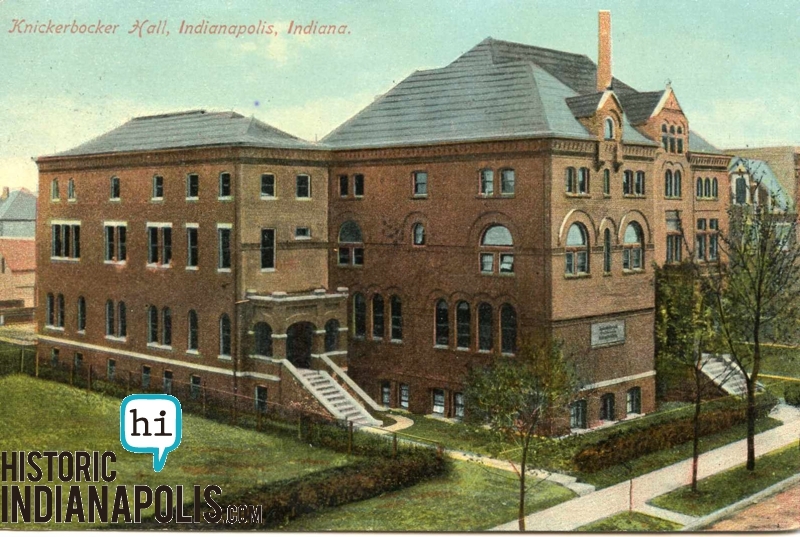 In 1900, the old frame annex, seen to the left, behind the main hall in the Indianapolis News clipping above from 1900, was replaced with a 3-story brick building, as you see in the historic post card view at the top of this article. 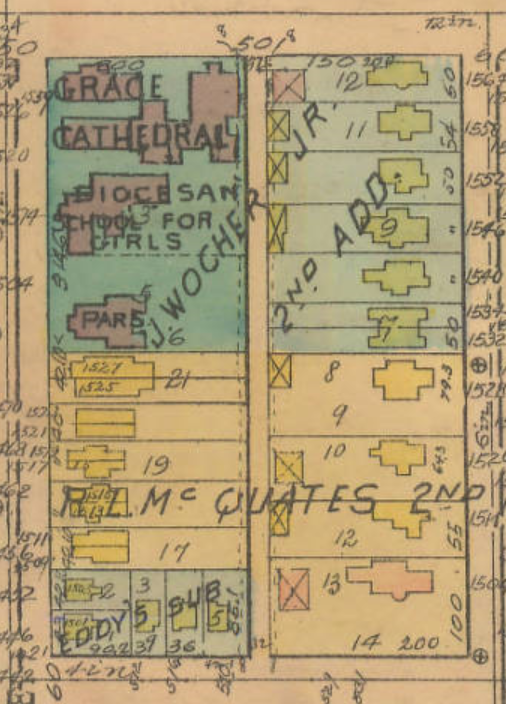 The girls’ dormitory can be seen on the right in the 1900 News piece above, and on the Sanborn map. 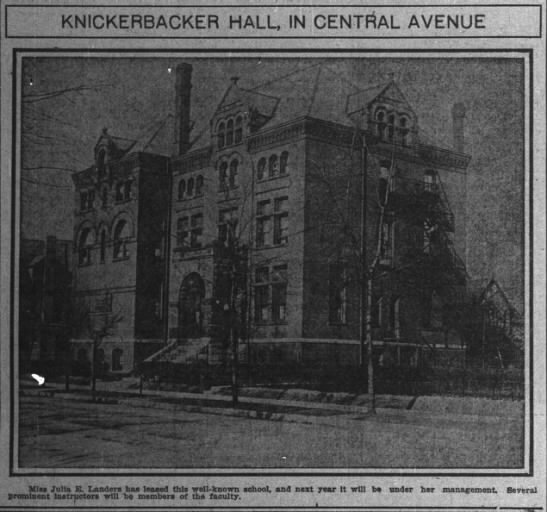 Newspaper photo of Knickerbacker Hall in 1907, as part of a story about changes in the management of the facility. The view is from the southwest. Image: Indianapolis News, August 7, 1907. 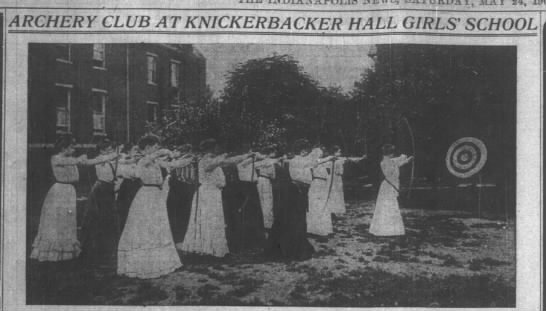 News photo of Knickerbacker Hall’s Girls’ Archery Club. Image: Indianapolis News, May 24, 1902. 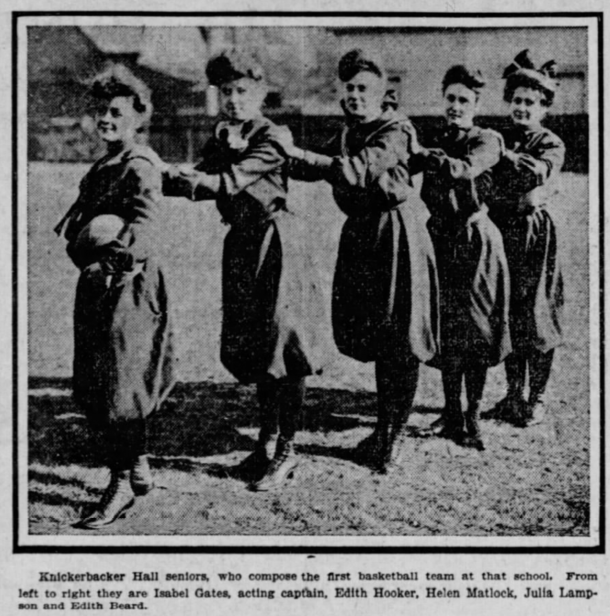 That wasn’t the only athletic activity in which the young ladies participated. In 1903, there was both a senior and junior class basketball team, and an accomplished fencing team that practiced at least 30 minutes, daily. 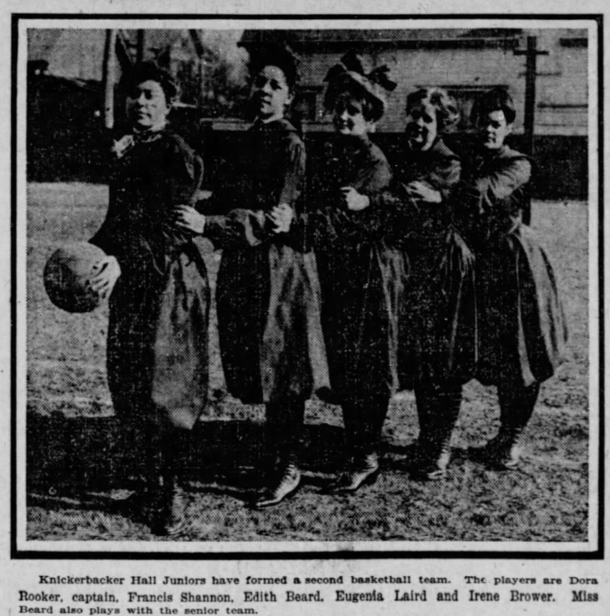 In 1903, the school’s senior basketball team set up games with female teams from Shortridge, Training School, Butler College and the Girl’s Classical School. Knickerbacker’s Junior Class also formed a basketball team. Newspaper advertisements appearing in subsequent years offered a glimpse of the more utilitarian side of schooling at the Knickerbacker. A notice of the school’s fall opening in 1905 promoted an opportunity for girls to learn telegraphy and railroad accounting skills for which operators could earn from $30 to $100 per month. Fencers practiced at least 30 minutes each day. 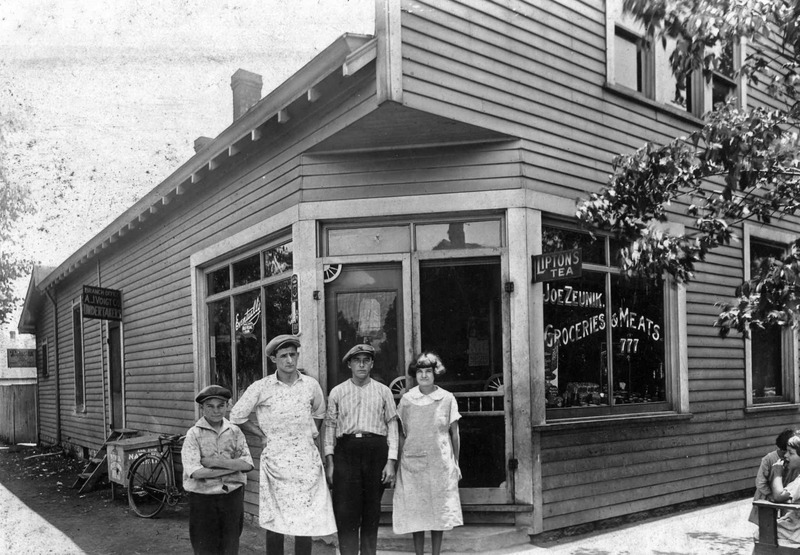 In 1912, Julia E. Landers, the school principal, announced her classes would be moving to 2049 North Meridian Street. Her non-religious affiliated school was misunderstood as such because the building which housed the school was owned by the Episcopalian church, and she wanted that distinction cleared up. 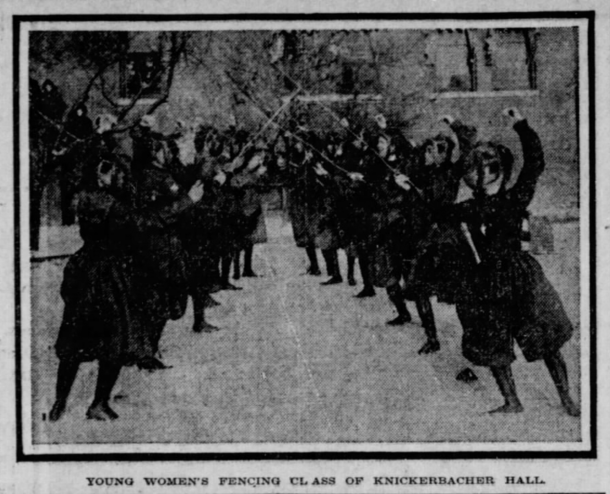 Shortly thereafter, an ad appeared saying: “It is a fact that Knickerbacker Hall is a comfortable home for working girls. The price of room and board is at the minimum. An average of forty-five girls makes their homes there the year round.” The rentals for working girls in this building appear to have only lasted a couple of years, until the Brooks School for Boys opened in the same location. 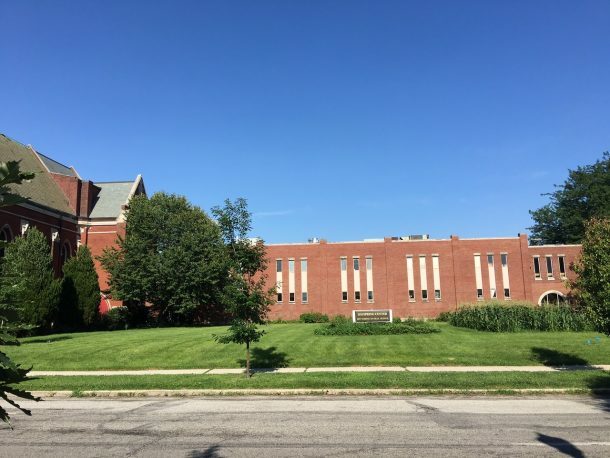 The name of the school changed in 1920 to “The Boys’ Prepatory School,” and what had prepared young men for higher education eventually became part of Park Tudor School. 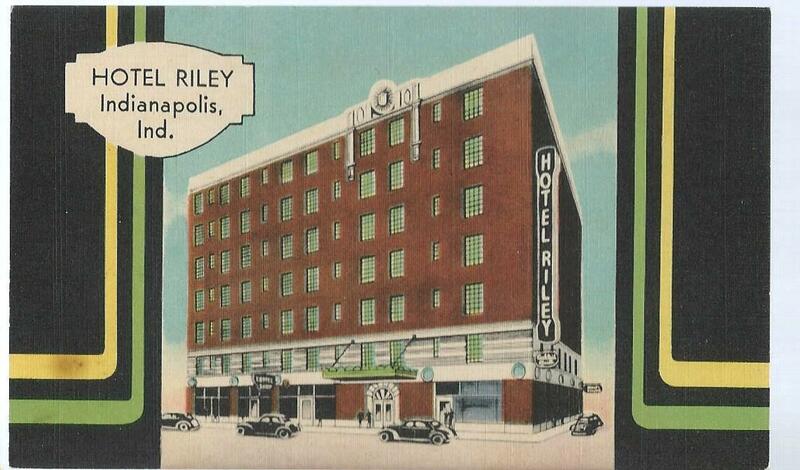 Because more buildings had been built on the church’s campus in the 1500 block of Central, it looks like the home for working girls relocated to one of the buildings south of the one featured here. 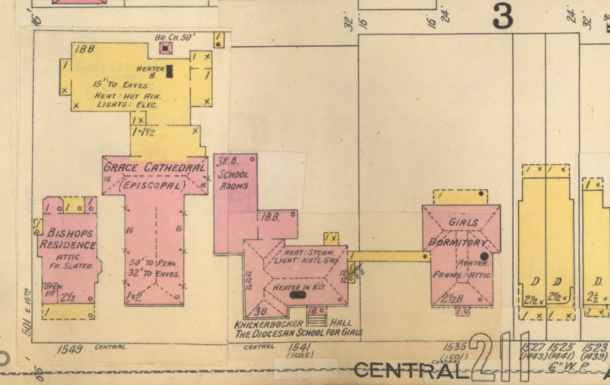 Site of Knickerbacker Hall (Diocesan School for Girls) in 1916. The school was gone, but the label was not updated. The area is bounded by 16th Street to the north, Park to the east, 15th Street to the south, and Central to the west. 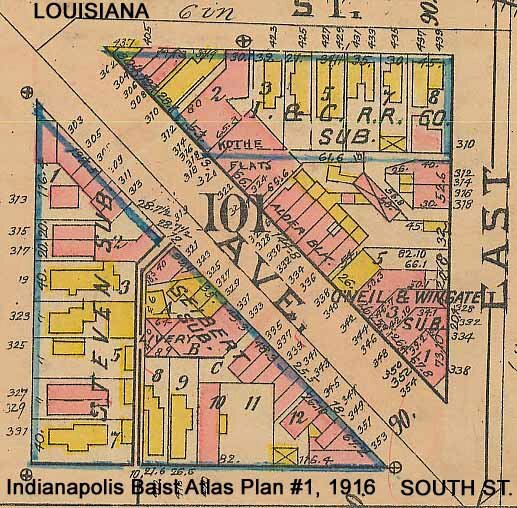 Image: Indianapolis Baist Atlas Map, 1916, IUPUI Digital Collections. Alongside All Saints Episcopal Church and the Bishop’s residence, Knickerbacker Hall anchored this exclusive section of the city for decades. 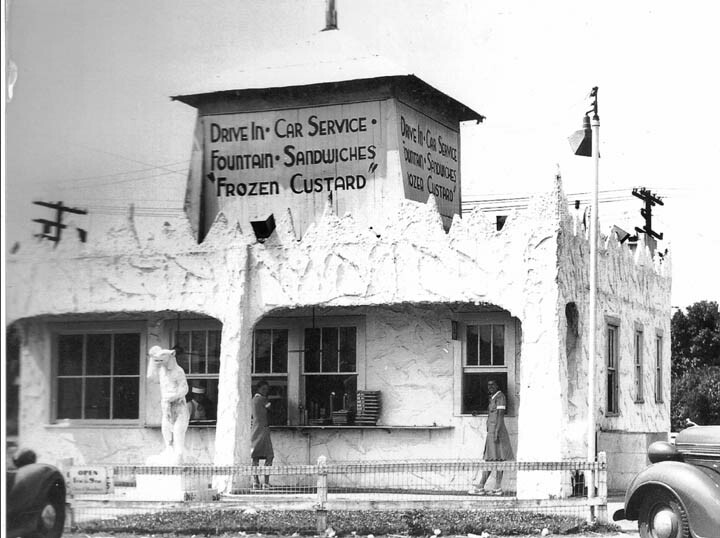 A 1939 news article reported that the building would be repurposed into a Community Center. 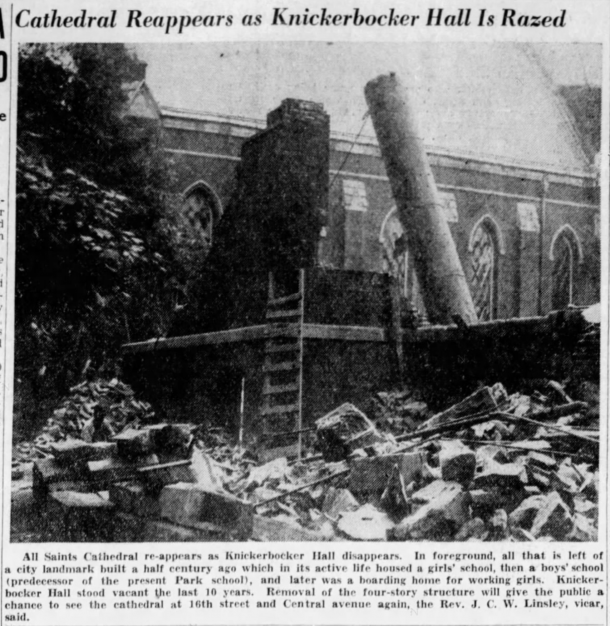 However, in 1940, Bishop Richard A. Kirchhoffer and the Cathedral Board of Trustees gave up on the latest effort at “rejuvenation,” and decided the Knickerbacker would be razed because it “did not lend itself to modern usage.” The Knickerbacker’s last event took place on June 7, 1940, when a church youth group held a Gay Nineties Festival. 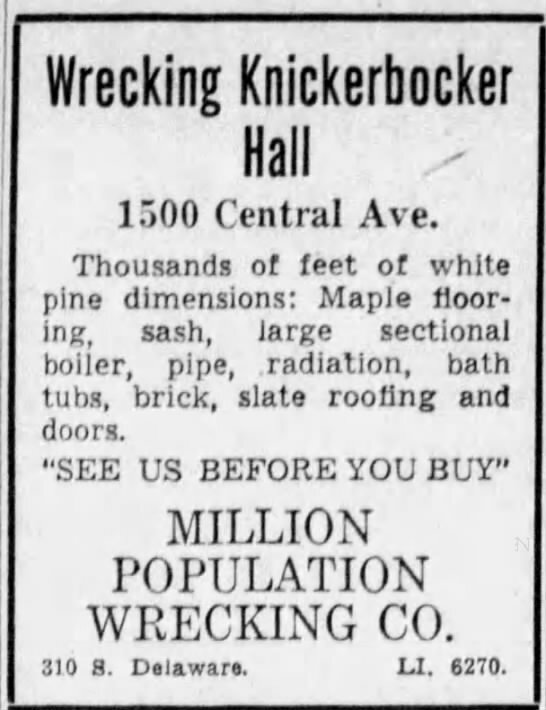 Wrecking Company ad announcing the demolition of “Knickerbocker Hall.” Source: Indianapolis Star, July 14, 1940. Two months after that, the job was all but done. A pile of rubble covered the area where the St. Mary’s/ Knickerbacker Hall/ Brooks School served numerous students over the years. Knickerbacker Hall, the Diocesan School for Girls, at 1545 Central Avenue, as it appeared in 1905. Image: Bass Photo Co. Collection, Indiana Historical Society. One notable graduate from the Brooks School was John W. Kern, 31st mayor of Indianapolis. His father had been a U. S. Senator from Indiana and the family lived in what is now Herron-Morton Place. Who in your family or circle may have attended one of these schools? Please share. Verdant lawns have replaced the impressive campus that once stretched through most of the east side of the 1500 block of Central Avenue.